Causes of high triglycerides levels – what are they? What are the causes of high triglycerides? Is it possible to take control of them? If yes, what can I do to prevent the high triglycerides problems? 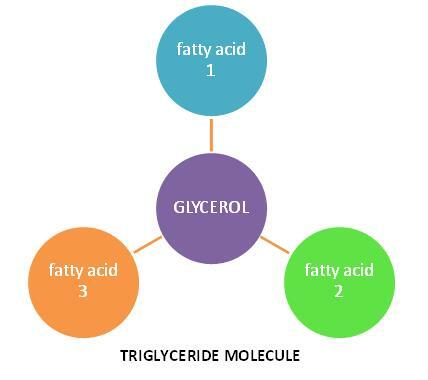 Triglycerides are complex fat molecules which are normally found in your blood stream. They are considered to the main source of your body energy, besides being the most famous kind of fat in the human body. Actually, whenever you eat food, your body will start to consume the amount of calories necessary for your rapid energy. The excess amount of calories will be stored in adipose (fat) cells to be utilized later. If you constantly consume extra calories in your daily food intake (fats, carbohydrates, starches, or even proteins), you will be soon dealing with the most common causes of high triglycerides. You should understand that when the amount of triglycerides increases in your blood, you will be increasing your risk to have a heart disease, xanthoma, stroke and pancreatitis. Remember: Your triglyceride level in the blood must not exceed 150mg/dl. But how can your energy metabolism become your worst enemy? And what are the causes of high triglycerides? In fact your unhealthy life style is one of the most common enemy causes high triglycerides. Certainly, Fast foods, snacks and eating too much are major causes of obesity. When we are obese, our bodies will suffer from serum-lipid imbalance; which means decrease in our HDL “Good” cholesterol level and increase in LDL “Bad” cholesterol and triglycerides. This is a fatal equation which can lead to serious conditions. Among the foods that are causes of high triglycerides are sugars (table and brown sugar), sweets (chocolate, jam, and candy), ice cream, cookies, beverages (cola, beer, wine), starches (potatoes, pasta, white rice and chips), and of course all types of fries (rich in saturated and trans-fatty acids). Physical inactivity, cigarette smoking, and increase in alcohol consumption can also cause high triglycerides levels, as well as influencing the lipid absorption system of your blood negatively. 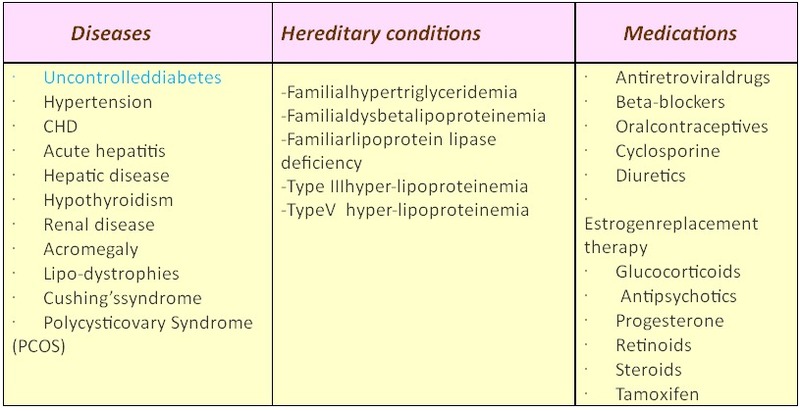 At the end I'd like to explain that the hereditary conditions mentioned in the table cause high triglycerides, and you cannot do anything to avoid it. The only thing you may do is to try maintaining a good level of triglycerides. Good levels for you in this case means nearly normal levels and not exactly normal, because that cannot be possible. Talking about the diseases which causes high triglycerides, there are some of them that you can do something to change your condition. Let's say about diabetes. If you are diabetic, then you will be suffering from high triglycerides in your body. Also, you must be probably having a significant decrease in HDL “Good” cholesterol level as well. Despite, high LDL cholesterol and triglycerides levels can enhance development of heart disease in any normal person; the harm is always more aggressive in a diabetic person. Furthermore, LDL cholesterol particles become more tinny and dense in diabetics; this will increase their ability to injury the arterial walls. That's why diabetes requires extra care for LDL cholesterol and triglycerides levels in your blood. And for sure, a good control in blood sugar levels helps you a lot. Each day, The American Heart Association advises you to take 2 - 4 grams of Omega-3 fatty acids (found mostly in fish), if you are suffering from high triglycerides level. Meanwhile, some medications, such as beta-blockers (if you are suffering from hypertension) or any other can cause you an increase in your blood triglycerides levels. If you are taking these medications for a short-time period, then after you stop taking them, everything could turn to normal. But you should have some patience, because it will need time. But, in case you are taking some life-time drugs (beta-blockers), then you should sit seriously with your doctor and talk what you should do to keep normal triglycerides levels. Most probably high triglycerides levels will be associated with other lipid proile change, and you must take care of them too. Anyway, all the above information is to make you conscious of what's happening with you, understand the causes of high triglycerides and take the right precautions. I know you can do it. Go on with your good willing. Keep firm. Stay healthy. What are the strategies to choose the right Triglyceride Diet? Some key-points to remember on How to Lower Triglycerides.